Welcome! We're so pleased that you have decided to apply for a place with Harris. We recruit on a rolling basis over the year and our training places fill up quickly, so you might want to apply as early as you can in order to secure a place on our training programme. 6. Welcome to the course! A standard equivalent to a grade C in the GCSE examination in a Science subject if you intend to train to teach at Primary level. Passed the Literacy and Numeracy Professional Skills tests prior to the start of the course. What kind of qualities and experience do I need to apply? One professional reference: someone who can comment on your character and suitability as a teacher. If you are applying for a salaried position, your professional reference will need to be from your current or most recent employer. One academic reference: for example, a current or recent University tutor. If you finished university more than five years ago, you may prefer to use a second professional referee. If you need help to find Harris Vacancies visit this page for support. Go to the application home page and verify your email address. The left-hand menu shows each section of the application and its status. You must complete every section before submitting an application, so leave plenty of time. London is separated into boroughs, there is no option for ‘London’. Do not choose ‘City of London’ unless this is the specific borough in which you live. 02 – UK student finance services. Search for Harris by provider code 1TZ. Programmes are listed alphabetically. Check whether or not you are applying for the salaried or non-salaried programme (salaried will be specified in brackets next to the subject). When submitting details of your qualifications, please include details of NARIC if you have an overseas qualification and have already obtained a Statement of Comparability. If you are retaking a GCSE, select ‘pending’ when you are asked for your grade. If you need to take an equivalence test, tick the box which presents you with this option. If you have a breakdown of your degree topics, you will need this to hand. Please fill in as much detail as possible. If your degree was subject-related we can see where your subject knowledge lies. If you don’t remember, check with your university or fill in the topics you know you completed. Include all work experience, whether or not this was in an educational context; this is especially important for salaried trainees who should have three years or more of work experience to be eligible. The personal statement you submit will be the one which goes to all three of your providers. Stronger applications come from those applying to one subject, who can demonstrate their passion to teach in their specialist area and how they can evidence this. Weaker applications come from those applying to several courses and therefore not demonstrating any of them as your greater strength. Your reason(s) for wanting to teach! Evidence that you understand the rewards and challenges of teaching. Details of your previous education and how you have benefitted from it. Any other work with young people, such as helping with a youth club, working at a summer camp or running a sports team. 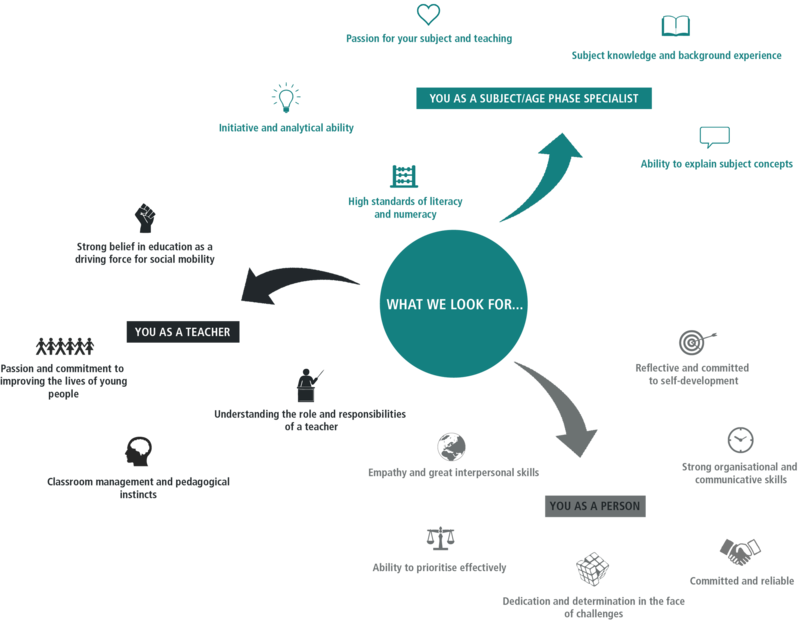 The range of relevant abilities and skills you can bring to teaching, for example, practical experience, managing people, working with or leading a team, and communication skills. Whether you have any experience of being in a school. You can use up to 4,000 characters or 47 lines of text (including spaces) – whichever comes first. Some word processing packages calculate character and line counts differently from the UCAS Teacher Training system, so you might need to redraft your statement if there’s a discrepancy between the counts. Write in English and avoid italics, bold or underlining. Get the grammar and punctuation right and redraft your statement until you’re happy with it. It’s a good idea to write your personal statement in a word processor first, then copy and paste it into your application. Once you have received both of your references, you will have your last chance to change any of your choices and then you need to pay and submit. Proofread your whole application again – spelling errors and mistyping contact details are common mistakes which can be easily rectified. Leave plenty of time to complete your application. Choose your referees wisely: people who you are able to contact easily to follow up so that they can complete your references quickly and avoid holding up your application! Include all of your work experience, even if it was not in an educational context. Ensure your personal statement tells us why you want to teach! Include any information regarding skills and work experience which are relevant or transferable into teaching. Ensure your personal statement is your own work - we want to learn about you! Print a copy of your form before submitting. If you studied outside of the UK, you should visit the National Academic Recognition Information Centre (NARIC) website to find out whether your qualifications are of an equivalent level to UK GCSEs and undergraduate degree. You will need to obtain a NARIC Statement of Comparability to evidence this prior to your application. Some GCSE level Engish qualifications obtained in non-English speaking countries are not equivalent to GCSE English Language as they are English as a Second Language qualifications. In this case, you would need to sit a GCSE English equivalency test. See equivalencytesting.com for further information. If your application is successful, we will contact you directly to invite you to an interview with the Harris Initial Teacher Education team at Harris Academy Bermondsey. What do I need to know about the interview process? You will most likely be interviewing with a small group of candidates. You will be provided with an opportunity to meet our team. We aim to provide you with the results of your interview as soon as possible. You will be provided with specific details of the interview process when we contact you to invite you to an interview. If you have been successful at the interview stage, we will organise a visit to your potential placement school. When you apply to us through UCAS, you are applying to Harris as a central provider, which means we can select your placement academy in discussion with you at interview stage. We will work with you to review how your subject and phase choice, location and preferences will fit with one of our academies. The details of your school visit will be provided when we contact you following the interview stage. Following a successful school visit, we will make you a formal offer through UCAS. You will need to accept this through your UCAS track. Congratulations! At this stage, you are now an official Harris ITE beginner teacher. The contact details of our team - our support begins the moment you are accepted on to the course!